Burgly Bully is a 5 Mana Cost Epic Neutral Minion card from the Mean Streets of Gadgetzan set! Rating: 3.5/5. From 783 votes. Troggzor, trade Prince Gallywitch. Any card that benefits from opponent spells has never been good. 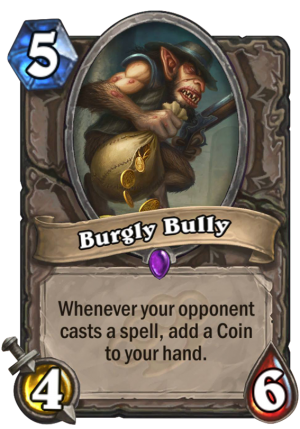 Its better a coin that a 3/5 that buff if more spells? Its better that taking a copy of the spell ? And trade Prince had premium stats! Both cards was crazy good in the mind of the pepole but horrible in Play. It does happen. If strictly better cards have never been played it also wont. And in Rouge fpr auctioner is not also good. Tomb Pillager first has better stats, second hits in curve, third guarantees the coin. Its really bad. I’d say it’s not that solid in druid. As when druid plays minions on the mid-late end of the curve, he wants totaly broken minions in order to stall or just ramp and removal spells. A 4-6 for 5 is enoying but not that good. Buutttt — a curve rogue In mid game with solid cards preparing for an auctioner turn 6.. is really really good. Isn’t it meant for some sort of Grimy Goons deck? You buff it up so it’s too big to trade with, so the opponent is incentivized to use hard removal or other damage spells against it? Would you replace a Pillager with this guy after the announcement of the counterfit coin in Miracle? I say heck ya! Now here is the question? Do you replace a Pillager for this guy or maybe two with the announcement of the counterfit coin in Miracle? Heck ya! You can’t “draw” more than 2 coins. Coin for going second is in your hand and these coins are added to your hand. The only two you can draw are the new coin card. So from that point coins are good for acutioneer. 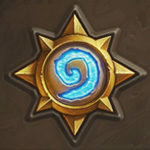 antonidas and him – best buddies. Playable for hunters to play Call of the Wild in turno 8 again? You could but nah. You don’t want to. Good in any deck looking to run Arcane Giants. Easy way to reduce cost or force your opponent to concentrate on removing a middling minion. I think Island good with Priest.